Hello... No problem at all normally, even in 10 vs. 10 when unit count remains 'normal' - but when major cheap tank spam happens and lots of units move at once, framerate drops, lag occurs and sometimes ends in a kick. Kick happened once today and once before (login name: gandhi), but I have encountered lag before in similar situations. - 8 GB RAM, SSD etc. From what I read on this forum, I am hitting the CPU ceiling... With an i7-2600 ? Is such quad-core processor really not enough ? Next time I play, I'll try to reproduce the behaviour and have a CPU graph. Meanwhile, any ideas ? Last edited by Gandhi on Fri 8 Aug 2014 16:35, edited 2 times in total. Successfully reproduced being kicked - this time with only 12 minutes to go until the end of that nice 10vs10 Ragnarok... Lots of action by lots of units triggers the framerate drop and subsequent kick reliably. The overall load remains perfectly acceptable on my system at values below 80%. One core seems particularly occupied at the end - it seems correlated with the abnormal behaviour, but its load barely climbs above 90% and never reaches saturation at 100%. 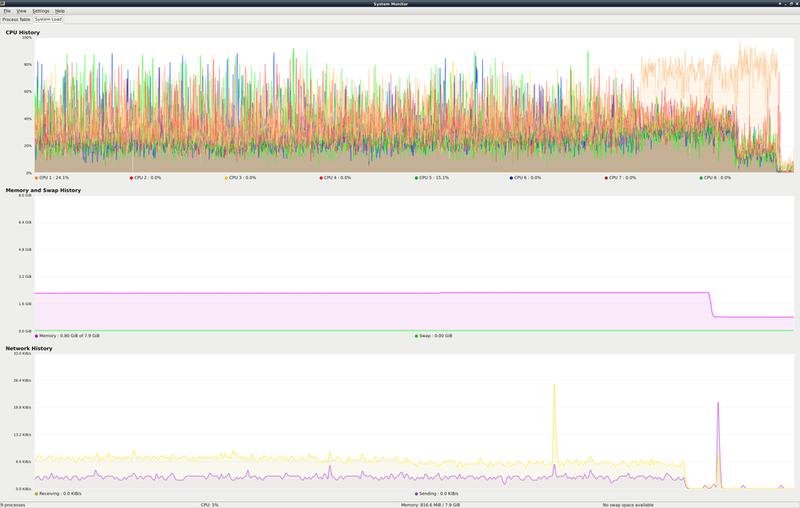 Burst of disk writing activity, with matching CPU waiting. The drop in RAM usage occurs around there, but I do not know if it is simultaneous. Any of that rings some bells ? Reproduced again... Everything works perfectly with my luxury deck but with my spam deck I end up getting kicked. Well... I guess I'll play with the luxury deck a bit ! You only get kicked in 10v10 with high unit amount, right? Shifu wrote: You only get kicked in 10v10 with high unit amount, right? Yes - especially when lots of units get moving simultaneously. For example when I stage large masses of infantry and tanks (lets say a hundred units) the game holds, but when I order them to assault, the framerate slows and the lag ends up in a kick. Last edited by Gandhi on Sun 11 May 2014 02:18, edited 2 times in total. Upgraded fglrx from 14.3~beta1.0-1 to 14.4-2 - seems to solve the problem - I went romping over Ragnarok with Polish hordes of T34-85, PT-76, ASU-85 and oceans of infantry... No kick. Some occasional hiccups, but nothing like it was. Also, I was sometimes encountering graphical artefacts in the icons that reminded me of memory corruption in JPEG (now that I think of it, I should have mentioned it). I thought that it was unrelated, but they have also disappeared. Looks like I suffered once more from AMD's sad bug-ridden driver - I would buy more of their graphic adapters if they had the good sense to liberate their code so that decent drivers can be had. I'll post here in a few days to confirm or infirm this resolution. Great to hear - thanks for sharing! So basically we are back to square one, but with a slight suspicion that causes of the problem may be found deeper in the graphics stack. Would a replay file help ? I could ask someone I played with tonight when the kick happened - a nice fellow player by the name of Degradeable might have it. Apart from the graphical corruption pattern bug that appears late enough in W:ALB that restarting it after each game is sufficient for avoiding its effect, W:ALB works well enough with low unit count decks that I felt like pushing my luck and trying to use my favourite Polish flood deck. Well... With many units, the framerate gradually drops and later it ends in the game crashing - no kick message, no disconnection warning countdown: just the application disappearing suddenly. I noticed that the crash happens when there is a lot of action going on. In one of those games, it was time for a final push so I had selected almost all my units and ordered them to the far corner of the map... Instant crash as soon as they started moving ! I know that W:ALB may not be your top priority at the moment... But since the graphical corruption pattern bug keeps me from playing W:RD at all W:ALB is my bread and butter at the moment ! So tell me if you need more information - I'll be delighted if anyone takes a look at this problem ! The processor load depends of the total amount of units in the game, not ony yours, so if you play with your "luxury deck" while every other player play with a spam deck you will certainly get kicked. I'll show this thread to the tech section to see if it can help.